gently guide kids through the English spelling code. teach phonics sounds systematically (one at a time). allow kids to review old phonics sounds (in Cognitive Science, this powerful learning strategy is called interleaving). 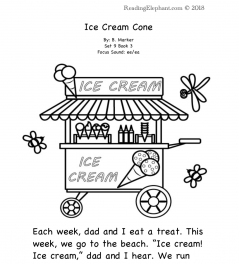 Our step-by-step phonics books are printable. Reading Elephant step-by-step phonics books teach decoding skills. Our books are printable. Therefore, they’re easily accessible. Print them as your student progresses. 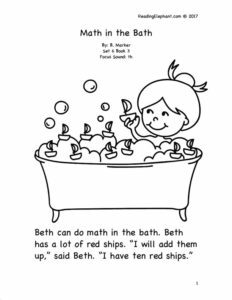 Our explicit, systematic phonics books help kids break the code. 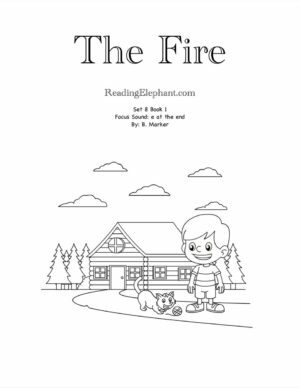 Reading Elephant books are designed for k-2 kids with reading difficulties, including kids with dyslexia, auditory-processing disorders, memory-deficits and kids who need research-based instruction. Reading Elephant advocates for research-based instruction. Our step-by-step phonics books are designed for kids like Daniel. In 2nd grade, Daniel couldn’t read. He dreaded school, acted out in class, and often cried when his mom tried to help him. “Do firefighters need to read?” he said one day as his mom drove him to school. “Yes, they do,” she said. His mom was overwhelmed. She often woke up in the middle of the night haunted by the fact that her child couldn’t read. Daniel had received every intervention available at school–he’d worked with a school psychologist, a speech language pathologist, a special education teacher and still nothing worked! Daniel’s mom desperately began looking for programs for kids that have profound reading difficulties. She discovered that struggling readers learn best with a gentle approach. Kids that fall behind need to learn phonics sounds one at a time. Struggling readers need to build their knowledge of English orthography (spelling) incrementally. Struggling readers are often expected to “just get” reading. However, research shows kids need direct, incremental instruction. Too often, we expect struggling readers to “catch on” to reading. However, many kids simply won’t “catch on.” Learning to read is hard. It requires massive cognitive changes in a child’s brain. Kids who struggle with decoding are bright. They simply need research-based instruction. They need a program that helps them acquire these changes gently and methodically. To see what educators say about us, read our testimonials. Why aren’t there enough books for struggling readers? Systematic phonics books are not readily available. The label “phonics” has been misconstrued. It’s difficult for educators to find books that introduce sounds incrementally. Most books that are labeled as “phonics” books introduce a whole variety of word types at once. Therefore, the child is never given the chance to master any of them. 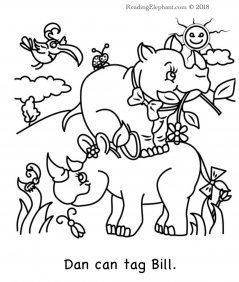 Reading Elephant offers step-by-step printable phonics books that ease kids into reading. Why does Reading Elephant offer printable phonics books? I was a reading interventionist in CA. I was dumbfounded by the lack of resources available for educators of struggling readers. I had trouble accessing quality phonics books for my students. 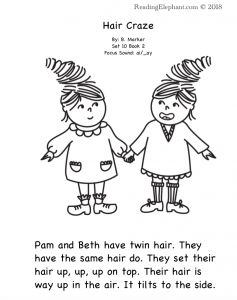 To help my students, I began designing systematic printable phonics books. I made them leveled, easy-to-use, thorough and systematic. As a result, clients loved them and began asking for more and more…until a whole series was made. What types of students can learn to read using Reading Elephant phonics books? 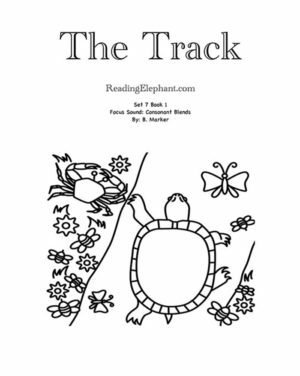 Reading Elephant books are carefully designed for struggling readers, including kids with dyslexia, auditory-processing disorders, ADHD, autism and language delays. 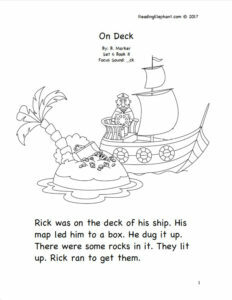 As a result, the printable decodable books allow students to learn phonetic units incrementally, meaning one at a time. Since the series is extensive, students can gain ample practice with each new phonics sound; they can develop accuracy and fluency. 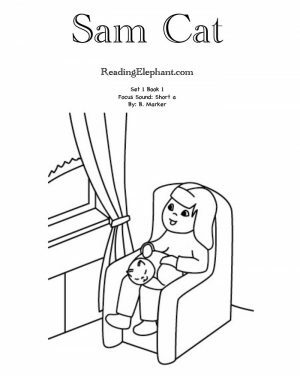 Educators use Reading Elephant books with students experiencing reading difficulties. How are Reading Elephant phonics books different from other phonics stories? 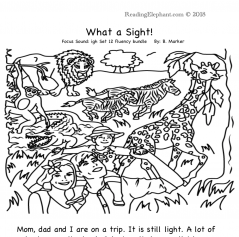 1) Reading Elephant books are not guessable, repetitive or designed so the pictures cue the student. In sum, our books do not encourage a sham form of reading. Students must read sound-by-sound. As a result, their reading progress is transferable to other texts. Students don’t simply memorize the language as in books with the following type of sentences… (I see the big hat. I see the big dog. –this type of text instills bad guessing/memorizing habits!!). Also, Reading Elephant pictures are fun, but don’t cue the student. Thus, kids develop decoding skills. 2) Reading Elephant books are systematic. Students learn phonics sounds incrementally. Phonics sounds are introduced one at a time. Kids gain significant practice with each new phonics sound, and they always get to review old phonics sounds. 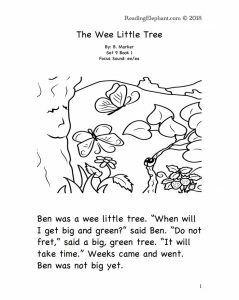 This incremental progression allows kids to gain confidence, and develop into accurate readers. Eventually, as kids learn to read each new phonics sound, they can focus on building fluency. 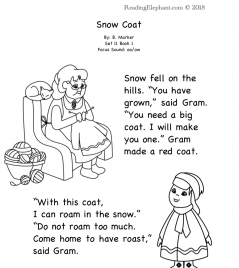 The books build a strong reading foundation and set kids on the path of independent reading. 3) Reading Elephant books are comprehensive. Most often, we take reading for granted. Sometimes, we assume reading is something kids acquire spontaneously. Not so. In English, there many phonics sounds, sight words and exceptions. In order to develop into an independent reader, students need exposure and practice with many phonics sounds. Since there are so many phonics sounds, Reading Elephant offers comprehensive books, allowing students to start at the beginning letter sound level and progress through the code.